Bardia national park is one of the largest parks in the region which is situated in the western part of the country. Bardia National park has been home for the several endangered animals, reptiles, birds and elusive tigers of course. Few years back, several one-horned rhinos were transferred here from Chitwan national park. This has been best place for the sight seeing and it is equally famous for observing wildlife experience. There are several lodges and tented camp that provides you comfortable accommodation. There is a beautiful park, located at the bank of the Karnali River . You can also take a trip for rafting down to the Karnali and Bheri River. Bardia is located in the sub-tropical lowlands of Nepal . You need to carry light clothes as the days are quite warmer herein summer. During winter (early November to February), mornings and evenings are cool, requiring a woolen sweater or a warm jacket. You may bring along a sun hat and glasses, swim-wear, binoculars, flashlight, sunscreen cream and insect repellent, which will come handy for outdoor activities. We recommend neutral colored clothing and comfortable walking shoes are essential. 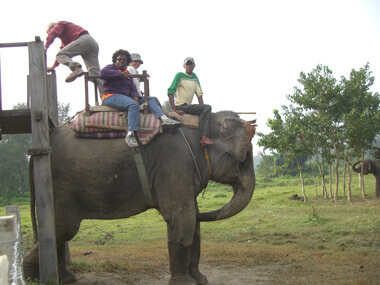 We can go to Bardia National park from Kathmandu , Pokhara and Chitwan national park as the buses depart there every day. Upon reaching the place called Ambassa, we leave the main highway and drive left for half an hour. There are several hotels that provide good facilities. We stay overnight there in hotel. 01 You will be transferred to Bardia National park after you arrive at Nepalgunj airport or Ambassa. You will be welcomed by refreshment in hotel. We give you a short brief about lodge and facilities. After briefing, you will go to your respective room. 15: 00- Village tour to a nearby ethnic Tharu Village where you will learn more about the life and lifestyle of the Tharus. 07.30 Elephant Ride. 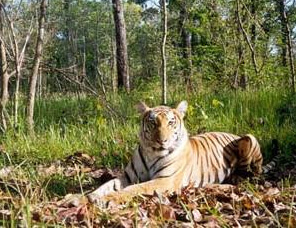 An excellent opportunity to see Asian Elephant, Great One Horn Rhinoceros, Spotted Deer or Chital, Hog Deer, Barking Deer, Samber, Swamp Deer or Barasingha, Nilgai, or Bull, Black Buck, Wild Boar, Royal Bengal Tiger, Leopard, Wild Dog, Golden Jackal, Striped Hyena. You will also encounter many other smaller mammals that have made Bardia their home. Visit to Visitor Center , Crocodile Breeding Center and Tharu Cultural Museum. 15.00 Jungle Walk. An excellent opportunity to see the wild animals, small mammals, birds, and waits in the Tower (Machan) to have the wild sightseeing, accompanied by our experienced naturalists, and wildlife tracker. Excellent photographic opportunities are plentiful. 07.00 Bird Watching. An excellent opportunity to see a great many species of birds found in Bardia. 14.00 Jeep Drive . An excellent opportunity to see wild animals and you will also encounter many other smaller mammals that have made Bardia their home.